The city of Rotterdam is experiencing an enormous hype, mainly thanks to its three new architectural icons: the Central Station by Team CS, the Market Hall by MVRDV, and high-rise De Rotterdam by OMA. International media rave about the metamorphosis of the harbor city and how it has evolved from Amsterdam’s ugly little sister into its cooler and more exciting sibling. But despite the glossy icons, Rotterdam still offers ample room for improvement. Its scarred urban fabric counts lots of desolate backsides and forgotten gaps. At the same time the post-war city center doesn’t comprise enough residential space. That’s why in 2012, the municipality initiated the program Klein & Fijn (Small & Beautiful). A map was produced, charting all the gaps in the city center which could accommodate up to 30 new infill dwellings. SkinnyScar by Gwendolyn Huisman and Marijn Boterman (2016). Copyright: Anneke Bokern. Several infill projects of this type have been realized over the last years, including a few that lie beyond the borders of the initial Klein & Fijn-map. What all projects have in common is that the plots didn’t offer much space, but all the more room for creativity and experiments. 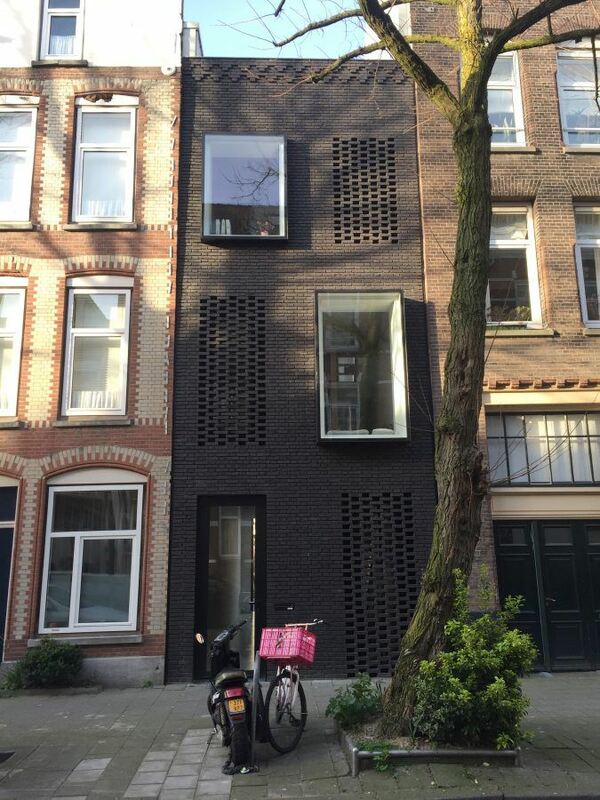 In Gouvernestraat all houses have brick façades – and so does the latest addition to the street, built in 2016. The house is fitted into a narrow gap next to a little passage that leads to a public courtyard. What’s not immediately visible is that the bricks, developed by architecture studio Architectuur MAKEN, are special: they’re made from recycled building waste and used here for the first time in a façade. The unusual composition of the bricks is given away by the header stones, which are sawn in half to expose their speckled interior, containing glass and ceramic particles. Inside the house, there are four storeys, each consisting of one large, open space of four by eight meters, plus a roof terrace on the top floor. Hanging out inside SkinnyScar. Copyright: Ossip van Duivenbode. Even narrower is a house in the north of the city, aptly named SkinnyScar. 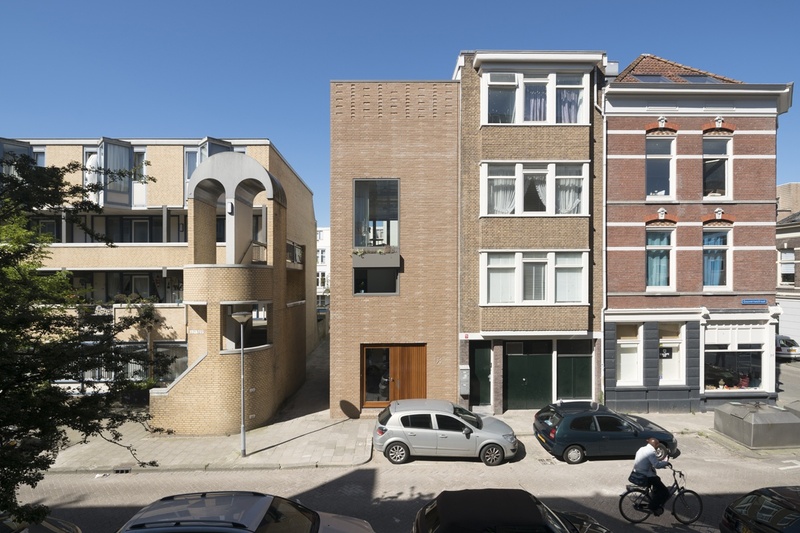 With a width of 3,70 meters, the gap in a row of historical houses was too small for a new dwelling according to official building rules, which require a plot breadth of 4,50 m. But this didn’t deter Gwendolyn Huisman and Marijn Boterman. After two years of negotiating with the municipality, the architect couple managed to buy the plot and realize their dream house in 2016. The street façade, made of dark brown brick, is rather closed, apart from two bay windows and three windows hidden behind half-open brickwork. The garden façade, in contrast, features a big glass folding wall and large windows. Inside, there are three 20 m deep floors without doors or hallways. A compact central core, encircled by the staircase, offers storage space and creates stability. The uncrowned king of tiny Rotterdam infills, however, is architect Joost Kühne. 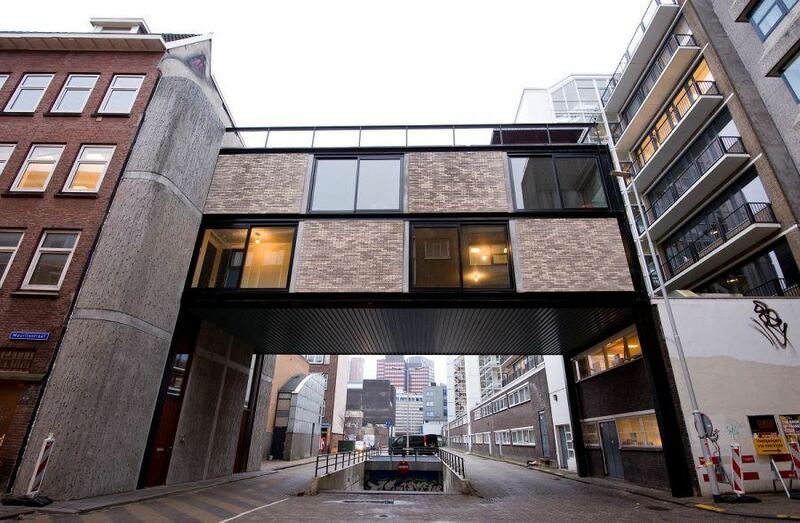 He has realized several gap houses, starting with his own office in Boomgaardstraat in 2009. The 54 meter long, but only 5 meter deep building was erected on a non-site, hovering on pilots above an existing parking lot, so no parking spaces had to be sacrificed. The brick building houses offices and a 220 m2 apartment on the top floor. House in Boomgaardhof by Kühne & Co (2010). Copyright: Edwin Prins. Just around the corner lies another project by Kühne & Co – although one should rather say that it ‘hangs’. Boomgaardhof is a void between two streets, lined by the backsides of buildings and used as a delivery and parking yard. 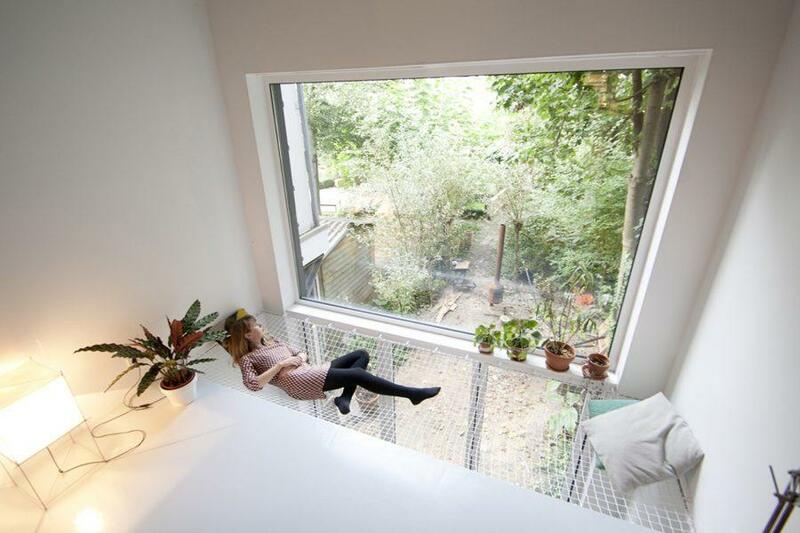 In 2010, Kühne & Co realized a small infill project above the entrance to this yard, hanging at a height of 5,50 meters. The staircase is located in a narrow concrete volume with rounded edges, attached to the existing pre-war houses on the north side. Composite girders span the gap to the lower post-war building on the opposite side, where two steel columns support the structure, creating a table construction. The façades consist of steel girders and prefab brick panels, with windows which are shifted horizontally in the front and back for privacy reasons. Inside lies a 150m2 apartment and 50 m2 office space – although only 26m2 of building ground were used. As these buildings show, small interventions can sometimes be just as interesting as gigantic new icons. 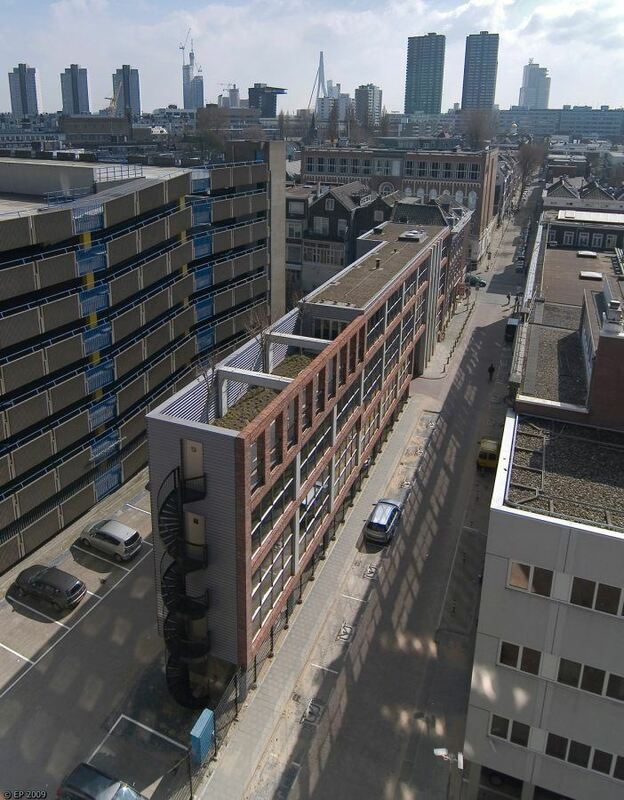 But more importantly, these infill projects in Rotterdam demonstrate that space-consuming new city extensions might not be the only answer to the housing demand. Maybe architects, municipalities and investors only need to open their eyes – and mind the gaps. Text: Anneke Bokern of architour, Guiding Architects member in Amsterdam and Rotterdam. First image: House in Gouvernestraat by Architectuur MAKEN (2016). Copyright: Ossip van Duivenbode.